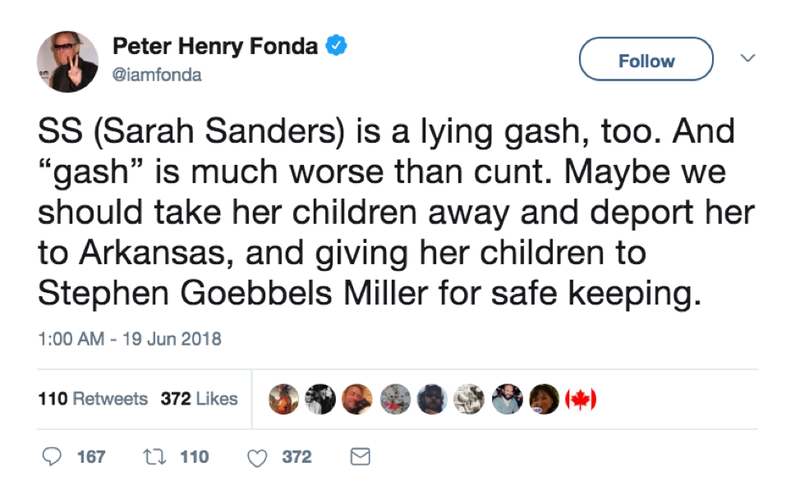 Trenton Democrats have been curiously silent on liberal activist and Democrat campaign contributor Peter Fonda’s call to have the President’s child put “in a cage with pedophiles”. Especially given their over-the-top behavior when it comes to band banners or photos of men in high heels or Facebook posts comparing Democrats to Fascists or mere humor of any kind (except Trump jokes, those – like the Bush jokes of yore – are permitted). Where is Lorretta Weinberg (does grandma approve of Fonda’s plan?) or Tom Moran (would he want to climb into that cage too?) or Britnee Timberlake or Ben Silva or NJTV’s Michael Hill or Jersey City’s Michael Maddalena or Michael Billy or Green Party moe Kenneth Collins… Where is the outrage? Where are the demands that he be fired or that his business enterprise be boycotted? Can we assume that “silence equals consent”? Isn’t that what the idiots above claim? Silence = Consent… correct? So YOUR silence means… what? Yes, they wanted the man’s head for writing that. Yep, that’s it. Where is the outrage? Where are the demands that something be done? Do they approve? Or are they just engaging in a sneaky bit of schadenfreude? Where is the National Organization for Women on this??? Why isn’t the Green Party’s Kenneth Collins organizing a rally on Newton Green? MEMO to Loretta, Tom, Britnee, et al… Don’t ever bring up “hate” again until you face this head on, openly discuss it, and state your opinions publicly.